Though the conversation is increasingly shifting to the upcoming Pokémon Ultra Sun and Ultra Moon, the mysterious new core game additions to Generation 7, Pokémon Sun and Moon continues to roll on. The immensely successful pair of games broke many new records for the series and for Nintendo in general, so it comes as little surprise that the Pokémon Company continues to support the game with Global Missions and Mystery Gift distributions. 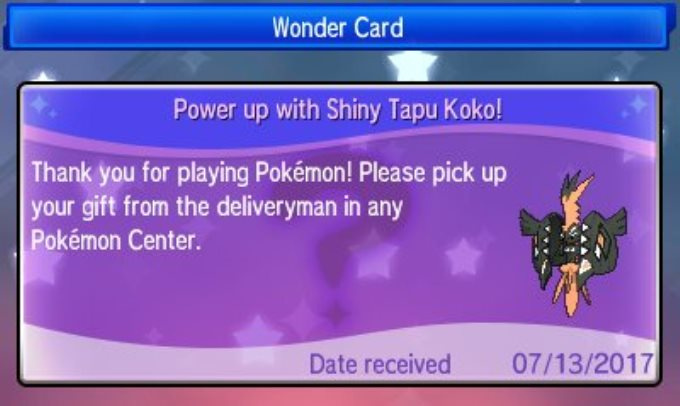 The latest Mystery Gift Pokémon is now available for all owners of Pokémon Sun and Moon, and it’s a shiny variant of one of the four Island Guardians, Tapu Koko. This Tapu Koko comes at level 60 with Electric Surge as its ability, and has the moves Nature’s Madness, Discharge, Agility, and Electro Ball. Though no date is given for when the distribution ends, it's likely only available for a few weeks, so make sure to grab it before the next Mystery Gift begins. What do you think? Will you be nabbing this Pokémon? How do you think Ultra Sun and Ultra Moon will compare to their predecessors? Share your thoughts in the comments below. Any signs of a European release? "How do you think Ultra Sun and Ultra Moon will compare to their predecessors?" We still know nearly nothing about them. Not much to say. I love the distributions that don't require me to go to Gamestop. I wish there were more of them. @tigermask available since afternoon yesterday. Also, @SwitchVogel , may be worth pointing out that's it's always a Timid one for competitive people. So get resetting for that hidden power. I don't recall but has Marshadow been released as a Mystery Gift? I grabbed mine yesterday. Could be worth mentioning in the title or an update to this article or a new article that it's available in Europe as well. Thanks for the heads up, folks. Just got my Koko with HP Ice(had to soft reset several times, but got it nonetheless). As for Ultra Sun/Moon, I'm hoping for some cool new Alola forms and return of the move tutors from OR/AS. Overall the ultra games will probably improve upon the original S/M. Just like how Black/White 2 improved upon Black White. I will check my Pokemon Sun later. Player who spent 40+ hours grinding for a shiny tapu koko only to finally get one this morning commits suicide. @SwitchVogel Exactly. So maybe you could actually report on that too? @HeroponRiki you can't "grind 40+ hours" to get a shiny Tapu Koko, mate. It's shiny-locked. Is this Mystery Gift through serial code? Yesterday I beat KH358/2 Days and Moon was next on my list. Perfect timing! @Tsurii I got timid on my first go. Glad I won't be resetting for hours to get one. @Serebii thanks I thought I missed it.